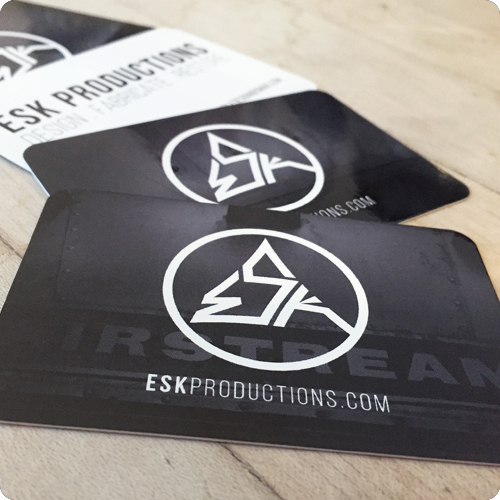 With ESK Productions, we aim to create a studio that helps others express themselves, either through branding, transforming a space, or wearing our clothing. We take inspiration from different cultures around the world and our favorite time periods throughout history. Our slogan Design / Fabricate / Restore encapsulates everything we do here. Design exists strongly in every facet of our company, from our own branding to the items we produce. Fabrication is constantly happening inside our shop, from small projects to full trailer restorations. Restore, the foundation of this venture began with the restoration of Airstream trailers. Still a large part of what we do, and something that will always be part of our lives in some form. We love vintage. We love striking visuals. We love self expression. And now with ESK Productions we can share all of that with the world. There is no place better to stretch our branding legs than with our own company. From day one we have structured our identity to be a professional representation of the styles we are drawn to. We wanted to give every branch of our company a distinct look while maintaining brand continuity. We developed a large range of products and marketing elements from business cards and signage, to merchandise and the packaging to send it off in. The brand will continue to evolve as we grow. We have made our two sides of the company yin and yang to each other design wise. While the mobile side remains light and airy, we push the graphic and urban lines further on the apparel side. Because we made our logo very versatile, by swapping the positive and negative shades we can transform it between the two worlds we create. Even with their differences, by using the same fonts, graphics, and similar layouts they remain connected. That idea continues on through the website. The mobile side has more content and needed to remain clean. On ESKapparel.com we let darkness take over. These dark shades highlight the graphic black and white or saturated jewel tones we use in our products.